How many barriers are between your website visitor's arrival and the result they want from you? That question is a huge part of UX, and it's an essential one when designing your company's online funnels. Are there barriers in design? Is it hard for your visitor to find what they're looking for? Are there barriers in what your visitor has to give in return for what you're offering? (see Chapter 5 for more on cost/benefit analysis). Are there technical barriers like browser limitations, broken links or bad gateways? Are there language barriers like jargon, serving only to confuse your site traffic? This chapter will dive into optimizing your site by making it simple, easy-to-use, and easy to convert on. We all acknowledge that ease of use is an incredibly important element of website design and conversion rate optimization, and it’s been mentioned a few times throughout this guide. But did you know that your target market may actually influence how easy you need to make your website design and platform? This isn’t because either gender has a better understanding of technology, computers, or the internet, but simply because men and women interpret and deal with information in different ways. In a study from Econsultancy, they found that the revenue generated from site searchers was significantly higher than non-searchers. Even though less than 10% of people were performing searches, close to 40% of the site’s revenue came from those searchers. Visitors who used the search option converted at 4.63% versus an average of 2.77% (about 180% more effective). Based on this knowledge, e-commerce site Black Forest Decor ran an A/B test several years ago on their homepage’s search bar. The control is on the left and the variation on the right. The total sum of these changes resulted in a 20% jump in conversions for people using onsite search, an 84% jump in average revenue per customer using search and a 34% increase in website conversion rate. Limit your nav bar to make primary options easier to interact with. For e-commerce sites (in particular) make your search bar a focus point of your homepage. Test a chat help box (particularly for SaaS businesses) on your product pages. 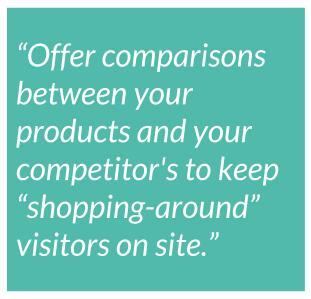 Offer comparisons between your products/service and competitors to keep “shopping-around” visitors on site. Your prospective customers aren’t blank slates. They don’t come to your site experiencing the internet for the first time. They have beliefs, assumptions and biases you can’t control (but can anticipate). The law of past experience (also called the concept of mental models) is the idea that our past experiences affect how we interpret our current ones. Now, that’s common-sense. Of course our past influences the way we interpret the world. If we, as a kid, had a bad experience with a neighbor’s dog we’re far more likely to be scared of dogs in our adult life. But that’s the crux: our past experiences are individual to each of us. What may influence one of your prospective customers won’t influence another in any way. Not all your target audience had a bad experience with dogs. 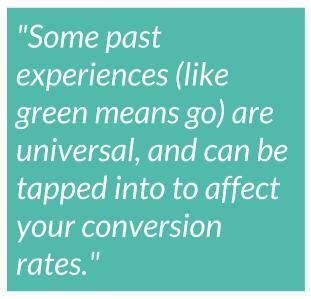 That said, some past experiences (like green means go or baby ducks are cute) are universal, and can be tapped into to affect your website’s conversion rates. You’ll note that their Control and Variation 2 are non-traditional “add-to-cart” buttons, while Variation 1 is the standard (synonymous with Amazon’s own checkout process). The traditional button (Variation 1), increased CTA clickthrough by 49%, however, Variation 2 was the real shocker. Simply adding descriptive text and creating a button with the words “Add To Cart” increased clicks by 49%. This is the law of past experience: new isn’t always better. Sometimes breaking from the norm can throw your site visitors off and tosses your conversion rates into the gutter. Consider your innovative next A/B test carefully before diving in. Are you introducing something which your users or visitors might not recognize? Are you _too_ innovative? The balance between “traditionally understandable” and “pushing the edge” is a tough one to walk. Don’t dive in headfirst without doing research and proving your hypothesis. So, while you absolutely need to keep the complicated psychological factors within this guide in mind, from divestiture aversion to the connotation of the color green, you need to remember that your website visitors are, above all else, lazy. 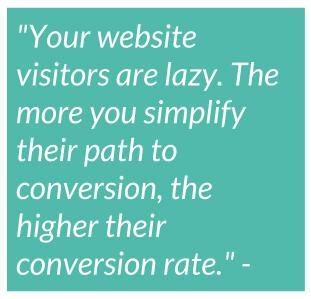 The more you can simplify their path to conversion, the higher the chance of them converting. Last year we ran a test on one of our sign-up pages to simplify the conversion “ask” of our visitors. All they have to do is start typing their lead information (without having to move the mouse the inch or so it’d take for them to click the field themselves). The page’s conversion rates saw a 56.4% increase. Eliminate distractions from your landing pages, particularly the Navigation bar or multiple CTA’s. Focus on a single conversion Ask. Implement auto-submit, auto-select, and pre-filled form fields to facilitate the conversion process (alongside limiting the number of form fields you have). Test using [click popups](http://corp.wishpond.com/website-popups/) instead of individual landing pages for email-gated content to keep the conversion process faster and easier. Each and every theory and principle in this guide is simply that, a theory and a principle. They're a great place to start your marketing and A/B testing strategies, but it's still crucial that you actually run the tests. "Results will vary" is one of the most important things to remember when you're optimizing for conversion. So get out there and tap into the irrational, the subconscious, the quirks and nuances of being human which make us act and buy. Get out there and start trying things! To head back to the Table of Contents, click here.